It contains calcium, strontium and trace elements (except iodine) required for growth and multiplication by corals and the beautiful encrusting pink and red coralline algae. We explain the necessity of these elements below. Calcium and strontium are the major cationic constituents of calcareous algae, skeletal material of hard corals and the skeletal needles of soft/leather corals. Growth and multiplication of these organisms means depletion of those substances. The trace elements included in Coral Grower allow organisms to carry out many biological processes. Iron allows several organisms to absorb nutrients. Cobalt is essential for the formation of several coral pigments. Zinc is, like manganese essential for photosynthesis and is also used in the formation of calcium carbonate by corals. These are just a few of the trace elements present in Coral Grower and we could give many more examples. This Supplement is highly concentrated and contains for example approx. 80,000 ppm calcium and 1,600 ppm strontium. To avoid an ionic imbalance, we properly balance the calcium and strontium with ions such as sulfate, chloride, bromide, sodium and magnesium. 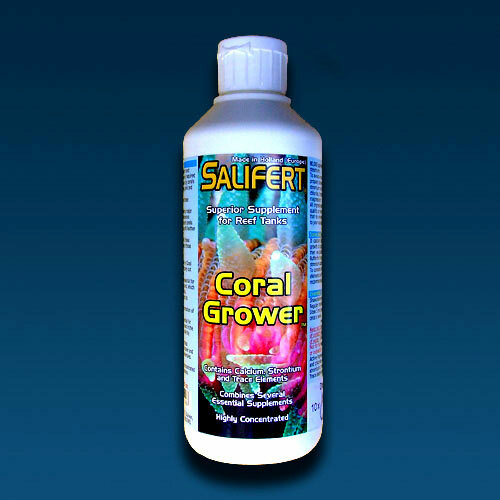 If calcium is depleted because of growth of corals and coralline algae then we also require Salifert KH+pH Buffer for the formation of calcium and strontium carbonates. To complete the range of trace elements our Natural Iodine is highly recommended. Active ingredients: sulfate, bromide and chloride salts of calcium, strontium, magnesium and sodium.